Since the 17th Century, grinding your own coffee beans has been an essential part of being a true coffee lover. The freshness and richness of recently ground beans are unequaled by most, if not all store-bought coffee. 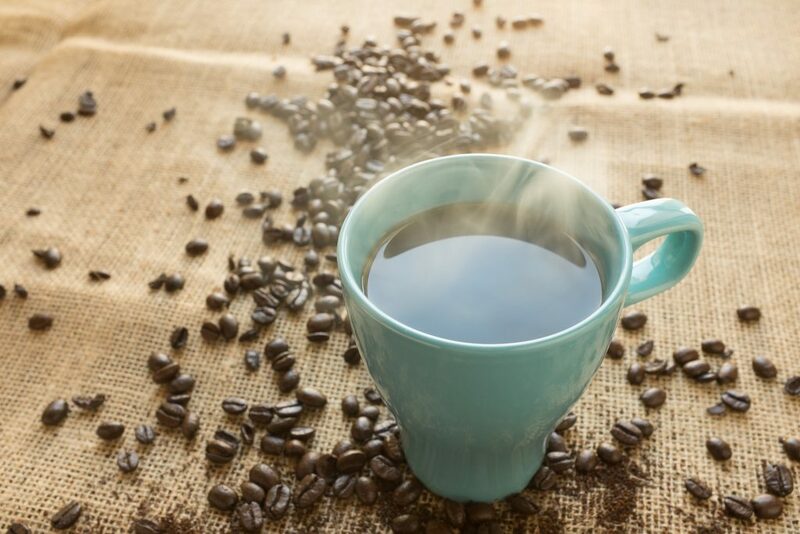 When freshly ground, the coffee is full of flavorful oils and aromatic compounds. These flavors are usually lost over time when stored in a ground-up state. Whether you source your beans locally or from a chain supplier like Starbuck’s, grinding your coffee beans just before brewing is the ultimate way to experience your coffee’s flavor. Today, there are numerous types of coffee grinders on the market, also known as coffee mills. These grinders range from simple hand-operated grinders to industrial size automatic burr grinders. Oftentimes, the choice can be overwhelming for those who want a high-quality coffee grinder for an affordable price. One of the best brands on the market today is Cuisinart, the leading kitchen cookware brand in the United States. The focus of today’s review is the Cuisinart DBM-8 Supreme Grind Automatic Burr Mill. 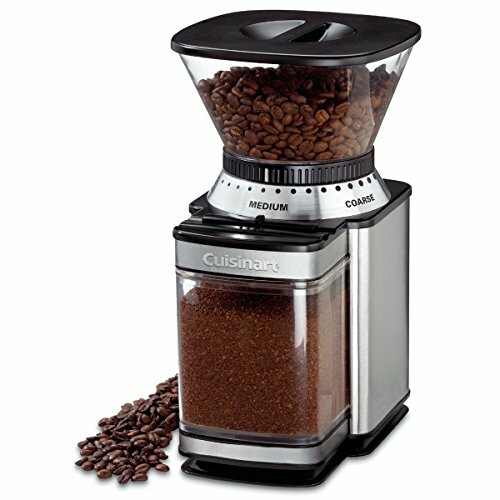 The Cuisinart DBM-8 automatic burr coffee grinder is without a doubt one of the sleekest looking grinders on the market. When it comes to design, the DBM-8 puts other grinders from Gourmia or KRUPS to shame. Finished in a stainless steel that has become a mainstay on Cuisinart appliances, the design is elegant yet unobtrusive. The grinder is only 76 square inches, so it will fit perfectly on your counter next to your coffee brewer, and it will look fantastic as well. Its small size also means that it can be stored in a cabinet with no difficulty whatsoever. Looks are not the only category in which the Cuisinart triumphs over its competitors. Features include a user-friendly dial to control the 18 level grind selector, so you can have the perfect level of coarseness or fineness. Users will also love the 8 oz. detachable bean hopper, as well as the sliding dial to control whether you want to grind 4-18 cups. The grounds holder has a 32-cup capacity, making it perfect for large families or for hosting social events. What sets this Cuisinart burr grinder apart from the competition is the speed and ease of service. The Cuisinart DBM-8 is a burr grinder instead of a blade grinder. This means that the grounds will be uniform and exactly the coarseness or fineness you desire. In contrast, the grounds from a blade grinder are typically inconsistent and chunky. Also, the Cuisinart grinder is automatic instead of manual. To grind your coffee, all you have to do is select the desired level, the amount of grounds, press the power bar, and go about your day. The grinding cycle is controlled by an electric timer, which automatically shuts off the grinder when the desired amount of grounds is reached. This Cuisinart coffee grinder debuted in 2004, and it has been a go-to option for coffee lovers in the United States, and around the world. For brewers who need a grinder with the ability to grind multiple pounds at once for use in a store or coffee shop, this machine may be found to be lacking in the necessary capacity. Also, doing consecutive batches of coffee grinding may cause overheating and premature wear. However, for home-brewers and offices, it is the optimal choice due to its small size and speed of use. Users of the Cuisinart DBM-8 Supreme coffee grinder report that they loved the ease of use and the speed of the grinding. This makes it perfect for those who love fresh-ground coffee, but also have a long commute to work. They also said they loved the sleek design and the fact that it takes up such a small amount of space. Another benefit of the Cuisinart that users reported was the grinder’s durability. You can expect several years’ worth of service from this brilliant coffee grinder. Some owners even stated they were able to use their Cuisinart DBM-8 grinder for more than 11 years! Coffee Gear Spy.com gives the Cuisinart DBM-8 Supreme Grinder 4.5 out of 5 stars. It is an excellent option for the time-pressed coffee artisan. The sleek design, speed of service, and affordability make it the ideal choice for home-brewers and offices, which may not need a multi-pound capacity grinder like most coffee shops require.